Happy Valentine’s Day! We all know that today is not just about giving love to special family and friends, but to ourselves, too. Self-love is a big deal these days, and it should be: when you’ve fully taken care of yourself, then you will have the energy and peace of mind to take care of others. In honor of that spirit of self-love, I’m writing about five simple upgrades that you can make to your diet today to make it more healthy and whole. Putting better food in your body more of the time means a healthier, more energized body and mind! And when you’re eating healthy breakfasts and lunches, then you won’t have to worry about going all-out on those scrumptious baby-back ribs and macaroni and cheese and craft beers at your Valentine’s Day dinner (barbeque: romantic cuisine in my book). I would never eliminate pasta from my diet entirely. That would be blasphemous to my Italian heritage! Nowadays, it’s more of an occasional treat than a staple in my diet. Because pasta – even whole-wheat pasta – acts like sugar when it’s broken down in your body – as do other carbohydrates such as bread, cereal, and rice, it’s best to avoid eating too much of it. A healthier choice? Whole grains such as quinoa, barley, bulgur, farro, and wheat berries, which are all pretty delicious and should be readily available at your local grocery store due to their rising popularity. Quinoa is easy to cook and incredibly versatile; you can eat it as a hot cereal for breakfast with some nuts, dried fruit, and almond milk, or you can throw whatever healthy stuff you have in your pantry in it to make a quick and healthy lunch or dinner. One of my favorites combos is chickpeas, yellow raisons, lightly roasted walnuts, diced parsley and feta with a little olive oil and lemon juice mixed in – yum! You won’t even miss pasta that much. And you know what else you won’t miss? I’m not talking about delicious fresh-baked bakery bread. That is one of the joys in life and has a place in our lives to be savored – unless you have gluton allergies, of course. Then you will savor a delicious gluton-free alternative bread. Anywho, for those of us who do eat wheat, remember when we felt so amazing when we switched over from white bread to that amazing whole-grain bread back in the late ‘90s/early 2000s? Aww, man, were we super-healthy and superior to all those Wonder-bread-eaters! Well . . . that’s what we get for gloating, because those whole-wheat breads are nowhere near as healthy as we thought. For one, they still act like sugar in the body like just white bread does, and two, most of them are loaded with a jillion ingredients, many of which are unrecognizable and/or nasty health-harming culprits – like corn syrup! My beloved Aunt Millie’s Hearth Fiber for Life 12 Whole Grains bread that I proudly bought for years? It contains 40 ingredients! Ahhhhhhh! An excellent alternative to regular bread is a sprouted-grain bread like Ezekial Bread, which is awesome because it uses sprouted whole grains instead of flour, meaning your body will break it down more slowly and you won’t get the sugar spike you would from wheat flower. Plus, it contains no processed sugar or preservatives or GMOs – yay! And Ezekial has sprouted-grain gluten-free breads – double-yay! You can find Ezekial Bread in your freezer aisle – it comes frozen. Let’s face it: even the snacks on the healthy side of the spectrum that you find at your typical grocery store are at least somewhat processed and containing a hefty amount of ingredients – and that’s the really healthy ones I’m talking about (don’t even get me started on the corn-syrup-laden granola bars and the 100-calorie snack-packs and completely sugar-raped yogurts that are so brazenly being marketed as healthy)! Of course, there are times when you’re not going to be able to plan ahead and have a healthy snack available with you, but most of the time you’ll find you easily can. Something as simple as throwing your favorite nuts in your bag before you run out the door or popping some (real!) 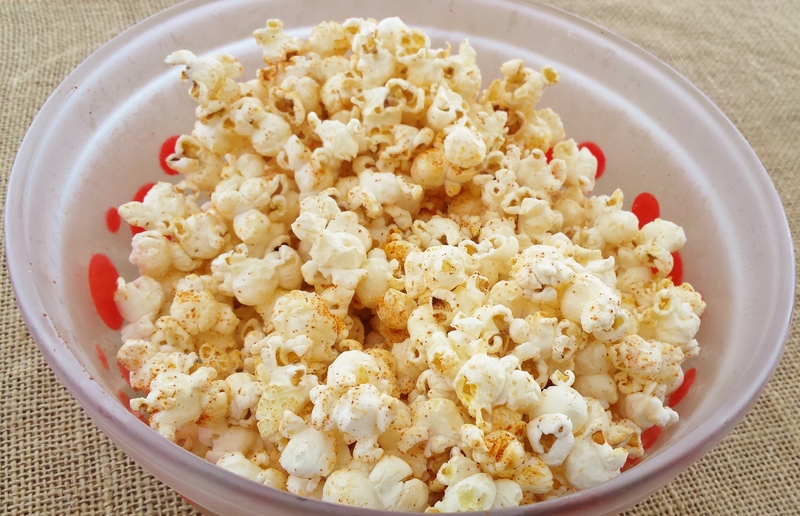 popcorn in an air-popper or on the stove the night before can make a world of difference in that you know all of the ingredients that are going in your snacks and therefore have so much more control over what you are putting into you. One of my favorite snacks ever that I look forward to every day at my day job? The oldie-but-goodie, sliced apples with natural peanut butter. So amazing! And that brings me to Number Three . . .. I was appalled by the thought of peanut butter with just peanuts in it? when I was younger. It sounded so bland and boring, and I had definitely bought into Jif’s marking campaign that it was this superior picture-of-health peanut butter. But have you ever looked at the Jif label? That stuff contains sugar and fully hydrogenated vegetable oils, including soybean oil (hello, GMOs), and honestly, when I eat it now, it tastes so off and fake to me compared to the delicious, nutty richness of natural peanut butter with nothing else in it. If you have peanut allergies, there are some awesome alternatives out there, like almond butter and sunflower seed butter. And even if you can’t into the just-nuts/seeds butter, you will still notice the taste difference in the organic alternatives with non-GMO sugar and oils. You won’t be able to put your spoon down! And when you’re done eating all of that peanut butter, be sure to wash it down with a nice big glass of . . . I know this one is obvious and can be hard if you’re a big pop/juice fiend. But water really is an excellent ally to befriend! It’s the best thing to keep you hydrated, your skin looking great, and your appetite in check (your body can confuse thirst with hunger when you’re not really hungry), and it flushes those baddie toxins out of your body. A good way to drink more water if you’re not really a big fan of it is to add fresh lemon to it or to infuse a big pitcher of water with sliced lemons, cucumber and mint and keep that in your fridge so that it’s always there and ready for you. It’s absolutely delicious and refreshing – and your body will love and thank you!